Wix is arguably the best do-it-yourself website builder . We rate it first among all website builders because of its array of attractive templates , ease-of-use, cutting edge innovation and value for money. Wix offers a number of different plans at varying prices, which we’ll explore to help you find the best plan for your needs. There is a free plan, and 5 premium plans, which increase in price as they add more features and functionality. All it takes to start building a website with Wix is a username and password. You don’t have to pay a dollar to choose a template and customize it with Wix’s drag-and-drop editor , or let Wix’s Artificial Design Intelligence (ADI) build your website for you in minutes. However, there are a couple of big drawbacks to a free Wix site that make spending a little money on a premium plan a necessity. With a free Wix website, you don’t have your own unique site address, such as www.mysite.com, but rather, you will have a Wix URL like, http://username.wixsite.com/mysite. In addition, a free Wix website will feature advertisements for Wix on your homepage. The free plan is essentially an unlimited free trial in which you can design a site and become familiar with some of Wix’s features. However, it is not a realistic long-term solution for someone who wants a serious personal or business website. Wix’s cheapest paid plan solves the biggest problem with the free plan, allowing you to connect your own unique domain to your website, however beyond that it is a very bare bones offering. It only costs $4.50 per month for an annual subscription, and drops to $4 per month if you want to opt for a 2-year subscription. You can also sign up on a month-to-month basis, but this will bump the price up to $7 per month. The downside of the Connect Domain plan is that you will still have Wix banners on the top and bottom of your web pages. The plan gives you 1GB of bandwidth and 500MB of storage. The bandwidth affects how quickly your site loads, and the more visitors you have to your site, the more bandwidth you will require. The more storage you have, the more media you’ll be able to upload to your site, such as images and video. The Connect Domain Plan offers significantly less bandwidth and storage than the other plans. In fact, free Wix sites include up to 500MB of storage and up to 500MB of bandwidth, so the Connect Domain Plan really only offer a small amount more bandwidth. Wix’s next tier up, the Combo Plan, removes the ads from your site, and gives you a free domain for one year. The plan costs $8.50 per month for a yearly subscription and drops to $8 a month if you opt for the 2-year subscription. Subscribing on a month-to-month basis will increase the cost to $12 per month, and it does not include a free domain for 1 year or the $75 in ad vouchers that you get with a yearly or 2-year subscription. Purchasing a domain from Wix will cost you $14.95 per year, plus an additional $9.90 if you want private registration, which keeps the contact info associated with the site from being publicly displayed. You can avoid the cost of a domain for the first year if you opt for an annual plan. The Combo Plan ups your bandwidth to 2GB and storage to 3GB, which is a significant increase over the Connect Domain plan. Wix's most popular plan is the Unlimited Plan, which is geared toward entrepreneurs and freelancers. As the plan's name suggests, it comes with unlimited bandwidth and 10GB of storage. The Unlimited Plan costs $12.50 per month for an annual subscription, and $11.50 per month if you are interested in a 2 year subscription. You can also opt to pay on a month-to-month basis, however, this will raise the cost to $16 per month. In addition, those subscribing to annual or 2-year deals will get a free domain for 1 year, a $75 gift voucher to advertise on Google, a form builder app to collect leads or put any other type of form on a website, and a site booster app which helps sites get found on search engines such as Google. The latter 2 apps would usually cost $48 and $60 respectively. Businesses that want to sell physical or digital products online will have to opt for Wix's Ecommerce Plan. The plan gives you 10GB bandwidth and 20GB storage to ensure that you will have plenty of space to upload pictures of your merchandise. An annual subscription costs $16.50 per month, while a 2-year subscription goes for $15 per month. 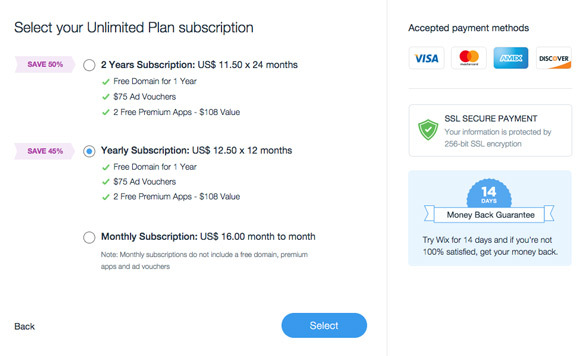 A monthly subscription costs $20 per month, and just like with the other plans, it does not include a free domain for 1 year like the yearly subscriptions do. In addition, the yearly and 2-year subscriptions give you the same added features that you get with the Unlimited Plan: $75 in ad vouchers, the form builder app, and the site builder app. Of course, the biggest advantage of the Ecommerce Plan is the shopping cart it includes to sell goods online and accept payments. The Ecommerce Plan allows your customers to buy multiple products, it gives you tools to track inventory, and discount coupon codes for your customers. You can also offer variations on an individual product, such as different sizes and colors. The shopping cart features shipping and tax rules to calculate the total price for your customers. Wix's top tier plan, the VIP plan, gives you everything that you get with the Ecommerce Plan and more. You get unlimited bandwidth and 20GB storage, no Wix ads, a shopping cart to sell products online, 10 email campaigns per month and a professional site review. The plan is $24.50 a month for an annual subscription, $23 per month for a 2-year subscription, and $30 a month on a month-to-month basis. monthly subscriptions do not include a free domain for 1 year, $75 in ad vouchers, the form builder app, or the site builder app. This is a good option for those that want to sell goods online who require more bandwidth than the Ecommerce Plan offers. In addition, the email marketing feature that is included in the VIP plan is a valuable tool if you're looking to grow your business. Unlike with the Ecommerce Plan, the VIP Plan also allows you to maximize your site's effectiveness with the professional site review, in which Wix experts review your interface and SEO to make sure you have the best possible online presence. Wix has a number of affordable plans with tiers that will fill the needs of individuals, small businesses and those looking to sell merchandise online. It is always more economical to opt for a yearly or 2-year subscription as opposed to paying on a month-to-month basis. The long-term plans will give you significant savings on your monthly rate, and more features than a monthly subscription. Keep in mind that there are some costs on top of the plan rates that Wix advertises, such as the annual fee for your domain after the first free year from Wix, and the cost of email accounts connected to your website. 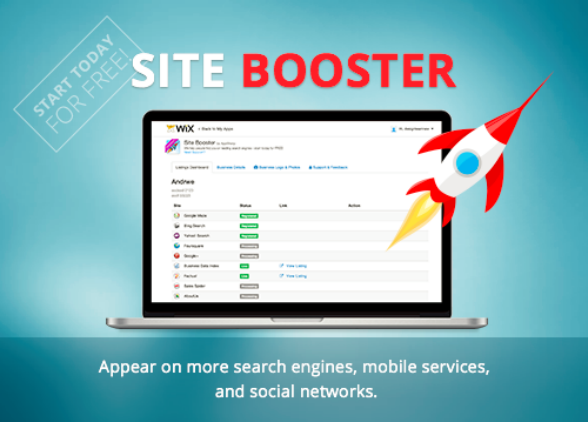 You can hook up a regular email to your website for free, but if you want an email with your domain name, such as email@mysite.com, you can purchase Google G Suite mailboxes from Wix for $4.08 per email per month. Wix also offers scalability, as you can always upgrade to a higher tier if your website traffic grows and you find you need more bandwidth or storage. Wix has a multitude of apps that you can purchase if there is a specific feature that you wish to add to your site, such as a search bar or a section for user feedback. Whether you want a pared down and simple site, or a high-powered online store with advanced functions, Wix plans offer you solid value for your money.